A N. W. Province Of Sicily, bordering on the Mediterranean and the provinces of Messina, Catania, Caltanisetta, Gir-genti, and Trapani; area, 1,964 sq. m.; pop. in 1872, 617,678. It is the largest and most populous of the Sicilian provinces. The coast is irregular and the surface is hilly, but there are many very fertile valleys. The country has a general slope N. toward the Mediterranean. Its streams are numerous but small. It produces grain, oil, fruits, almonds, manna, sumach, liquorice, and silk. A City (Anc. Panormus), capital of the province and of the island of Sicily, in lat. 38° 6' N., lon. 13° 20' E., 120 m. W. by S. of Messina; pop. in 1872, 219,398. It is on the N. side of the island, on a deep bay between Capes Gallo and Zaffara-na, and in a rich plain which is surrounded on the land side by two distinct mountain ridges. This enclosure between the hills and the has been called from its form and beauty the Conca d'Oro, or golden shell. The situation is extremely picturesque, and the numerous spires, domes, and towers present a striking appearance. The climate is delightful, especially in winter, when many invalids and other strangers reside here. The harbor, formed by a mole about 1,300 ft. long, is spacious. The city proper is nearly rectangular, and forms an oblong parallelogram, about 4 m. in circumference. It is surrounded by decayed walls, entered by four main and many minor gates, and defended by bastions. The harbor is protected by a strong citadel and Forts Galita and Sant' Erasmo, and the lighthouse battery. Palermo is divided into four nearly equal parts by the corso Vittorio Emmanuele (previous to 1860 the Cassaro or via Toledo) and the corso Garibaldi (formerly via Macqueda or strada Nuovo), which intersect each other at right angles in the centre of the city. The longer of these runs from the sea to the royal palace, which is at the inland extremity of the city. At their intersection is the large piazza Vigliena or Quattro Cantoni, which is octagonal, having upon four sides the vista of these streets, and upon each of the others a handsome building in the Grecian style. There is a larger square before the palace, in which is a bronze statue of Philip IV. of Spain. Numerous smaller streets without any regular plan run into these two, but are all narrower and dirty. The whole city is well paved with large blocks of lava. The Marina, a terrace 80 yards wide, extending for about a mile along the seaside, is the finest and most popular place of public resort. The corso Garibaldi contains more churches and palaces and the corso Vittorio Emmanuele more shops, and both are alike remarkable for animation. Every house is abundantly supplied with pure water from the numerous reservoirs (giarre), which were originally established by the Saracens, generally at the corners of the streets. The houses generally are built in the same style as those of Naples, with flat roofs, terraces, and Venetian blinds; they are divided into flats, each flat forming a distinct dwelling. - The principal public edifice is the royal palace, at the S. W. extremity of the town. The cathedral is a Gothic structure of the 12th century, to which a modern dome has been added; the interior is supported by 80 pillars of oriental granite, and divided into chapels. This cathedral contains many mausolea in red porphyry, among them those of Roger, the Norman founder of the Sicilian monarchy, and the emperor Frederick II. The south porch is the most highly ornamented, and has a celebrated marble doorway exquisitely carved. The crypt, E. of the choir, popularly called Tutti i Santi, and occasionally the catacombs, measures about 100 ft. from N. to S. and 30 ft. from E. to W. exclusive of the apses, and contains more than 20 sarcophagi with the remains of local archbishops. The chapel of Santa Maria, the place of coronation of the Sicilian kings, was destroyed by the bombardment of 1860. The richest of all chapels is that of Santa Rosalia, constructed in 1631, some time after the discovery of a chest of solid silver of the weight of nearly 1,300 lbs., containing the remains of that patron saint of Palermo. 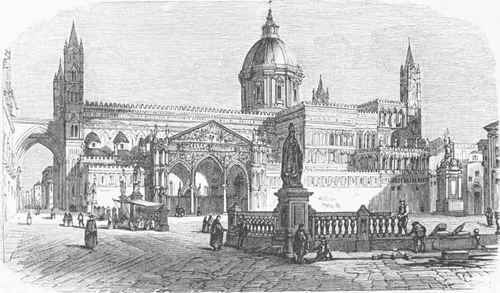 (See Die Cathedrale zu Palermo, by Becker and Forster, folio, Vienna, 1866.) Palermo is distinguished for the number and magnificence of its churches. One of the most gorgeous is that of Santa Oaterina, finished in 1596. It is a large edifice of Corinthian architecture in the shape of a cross, with a single aisle and a dome. Within the choir the pavement consists of marbles in Florentine mosaic. The most celebrated among the numerous paintings is a Madonna, variously attributed to Rubens and to Vandyke. The Casa Professa, consecrated in 1636, and formerly belonging to the Jesuits, is remarkable for its size and adornments, and contains some of the finest of Novelli's pictures. Red, white, and black marbles are conspicuous in many parts of this church. Among other churches noted for magnificence is that of San Domenico, founded in 1640 by the Dominicans, and built in the Roman Doric style, divided into three aisles by 16 large columns of gray marble, and accommodating nearly 12,000 persons. The church serves also as a Pantheon (Santa Croce), and has many monuments of distinguished Sicilians. The church of Mortorana or Santa Maria dell' Amiraglio, popularly called San Si-mone, is one of the earliest Norman edifices in Sicily, of the 12th century. The exterior has been modernized, but the interior retains some of the original mosaics. The church of San Giuseppe de' Tiatini, begun in 1612 and completed in 1645, is of composite architecture and supported by 26 massive columns in the nave and aisle. Santa Maria della Catena, or Parrochia della Kalsa, dates from the 14th century, excepting the "W. front, remarkable for a strikingly picturesque portico, which was rebuilt about 200 years later. It contains many chapels and many sepulchral monuments. The private chapel of the royal palace, built by Roger, first king of Sicily, in the form of a basilica, although small, has all the characteristics of a large church. Almost the whole of the walls and dome is covered with mosaic pictures on a gold ground. Palermo is the see of an archbishop. It was formerly noted for the number of its monasteries and nunneries, but these were suppressed in 1867. Among them were La Gancia (S. Maria degli Angioli), formerly the most extensive and renowned, and the Capuchin monastery outside the city, with celebrated subterranean vaults, where the standing bodies of the dead present a ghastly spectacle. An ancient subterranean cemetery (Le catacombs) was discovered in 1785 outside the gate of Ossuna. The teatro Belloni, rebuilt in 1803, is the largest and most fashionable theatre, and there are five others. The festival of Santa Rosalia is celebrated July 11-15 by fireworks, the procession of the saint's car, and illuminations in La Flora, the principal public park and a familiar lounge, at the S. end of the Marina. The university of Palermo, founded in 1447, has a valuable collection of antiquities and a library of 40,000 volumes. In 1873 there were 56 professors and 306 students. There are also an academy of sciences, a nautical school, a museum with large art collections, a conservatory of music, a botanic garden, and many other institutions for the promotion of learning, including an observatory about 250 ft. high (in the royal palace), celebrated through the discoveries of Pi-azzi and other astronomers, and possessing renowned astronomical instruments. The public charities embrace several hospitals, a foundling institution, and a lunatic asylum. - The city has a supreme court of justice, a court of appeal, and a commercial tribunal. The chief manufacture is silk; cotton, oil cloth, gold and silver.articles, and hardware are also produced. The total value of exports for the year ending Sept. 30, 1873, was $9,078,090, of which $4,-125,250 were for oranges, lemons, and other fruits; of the exports, $2,327,492 were to the United States. The value of the imports was $4,254,260. The tunny fishery carried on from the town is very productive. - X. W. of the city is the Monte Pellegrino, an abrupt rocky mass, famed for a cave or grotto to which St. Rosalia, a Norman princess, retired to lead a contemplative life; it is now a sanctuary, and an annual pilgrimage is made to it from Palermo in solemn procession on July 15. - Palermo was the earliest settlement of the Phoenicians in Sicily, and became the chief seat of their power there. It was by the Greeks called Panormus, a name derived from the excellence of the anchorage near it. In 480 B. C. the city was taken by the Carthaginians, who kept possession of it till 276, when it was captured by Pyrrhus, king of Epirus; but it was soon retaken by the Carthaginians. It was taken by the Romans in the first Punic war, 254 B. C., and was a colony throughout the continuance of the empire. It fell into the hands of the Goths, was wrested from them by the Byzantine general Belisarius, and in A. D. 835 was taken by the Saracens; it was by them made the capital of the island, and retained the same dignity under the Norman kings, who in the 11th century drove out the infidels, and in the 12th founded the kingdom of Sicily. The court resided at Palermo until Sicily was united to the kingdom of Naples. The city has suffered much from earthquakes. During the insurrection of 1848 it was bombarded by the royal troops. Garibaldi, having landed in Sicily May 13, 1860, entered Palermo on the 26th, conquering it after a protracted fight in the streets; and by convention the Neapolitan army evacuated the city on June 6, when it became the seat of the provisional government. An insurrection against the abolition of the monastic orders broke out in September, 1866, but was suppressed by the royal troops after much bloodshed.